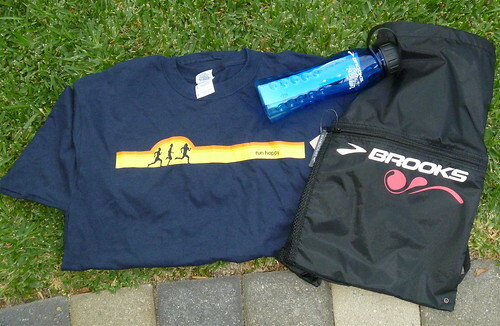 A t-shirt (which is a size too small, sadly), a drawstring backpack, and a new water bottle. You can never have too many water bottles, after all. The shirt is kind of retro. The first thing I thought of when I saw it was my old summer camp shirt. From 1987. How cool is it to win a little goodie bag? Run Happy, indeed! 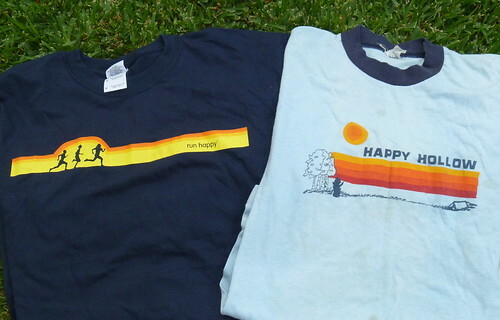 i can’t believe you still HAVE a happy hollow tshirt for comparison. It’s the one that has a whole bunch of signatures on the back. I can’t help it if I’m sentimental!